So if you are searching for a property for a family vacation, special occasion or corporate retreat – then please email me with the brief and I shall respond on the same day with immediate availability and options for you be it for business of private use. Even after 15 years of owning the Susan Reid Collection business, I still find myself assuring agents that their commission is protected when working with me. Sales and Marketing Representation is more common in other parts of the World and as such there is often confusion as to my role with the properties I market on the Susan Reid Collection Portfolio. My business model and policy is always to only work on a retainer basis with my properties. I get approached all the time from Owners wishing to be part of the Collection and pay commission for any business placed but this is not my model nor does it protect my clients i.e. the agent. The Owners I work with build a relationship with me and understand I have many years of experience and a large client base in which I market only my Collection to. The client base has taken many years to build, develop and obtain a good level of trust to act on my recommendations for where they should place their enquiries. This relationship is developed through many sales calls, face to face meetings and presentations all of which take place both National and International. As such every proposal I offer on a property to an agent protects their commission. The rate strategy for properties I have put in place with the Owners so this will be the same should they email the property directly or myself at Susan Reid Collection. The agent can also be assured of my honesty in recommending which property is suitable for their client – or not if that be the case. My aim is to always match the enquiry with the best property to ensure all expectations are met and often exceeded. A one stop shot, 24 hour response rate and the most stunning of Scottish properties awaits you at the Susan Reid Collection. own boss – I have to say I do like it! exclusive use – I now solely market properties for private hire and have to say this is where my passion lies – the Castle girl once called! loyal clients – I would be nowhere if it were not for the loyal and supportive clients who book with me time after time – thank you! personal touch – there is a reason I call the business Susan Reid Collection and that is down to the fact it is all me! So here’s to the next 15! The properties were made up of two plots when we bought them with derelict outbuildings in place. We loved their setting in the countryside and the fabulous panoramic views. Yes, the estate dates back to the 1840’s. The Roundel’s main sitting room was used as a horse mill by using animal power to grind grain. No! They are all lovely. Visit the famous Swilcan Bridge in St Andrews which is on the 18th hole of the Old Course at the Home of Golf. A golfer or not this famous bridge is one of the most iconic settings in golf and it has felt the footsteps of the true greats. Fish and Chips from the award winning Anstruther Fish Bar. Take a road trip around the fabulous coastline from St Andrews to Elie and visit all of the picturesque small working fishing villages. And lastly…..What insider tip would you pass on about the property or the area? There’s a great Michelin-starred restaurant on our door step called The Peat Inn. You do have to book in advance but it is really worth a visit if you are lucky enough to secure a table. Self catering is on the up as more families and groups of friends are choosing this way to vacation in Scotland. Whether you want to snacks in the cupboard for the kids, or like to have a glass of wine or two with your evening meal, travelling on a self-catering basis will allow you to buy all of your items for less in local shops, markets or supermarkets – so you can enjoy guilt-free treats. Travelling on this basis is also a great choice if someone in your group has a special dietary requirement, or if you want to cook familiar meals. When you are a group of friends there might be some in the party up earlier for a golf tee time or later to bed looking for midnight snacks – so this option appeals to all and if you want to come down in your bathrobe and slippers for breakfast at midday – then be our guest! Hotel prices or Exclusive Use? The Susan Reid Collection of properties are all privately owned for which I manage the sales and marketing directly on behalf of the Owners. So you might say I am more biased towards exclusive use hire properties but I do have experience of this having spent 10 years working in hotels before I set up my own business. Hotels – you book a block of rooms but can be a small group in a large hotel OR EXCLUSIVE USE you are the only party and have the property entirely to yourself. Hotels the price!!! OR EXCLUSIVE USE when you split the cost by your number of guests and add the flexibility and competitive catering pricing and bringing your own alcohol – this is always the less expensive option overall. What an exciting time for Golf in Scotland over the last couple of weeks. Firstly the Scottish Open in Gullane, then onto the Open at Carnoustie and to finish off the Seniors Open at the Old Course whilst the Ladies Scottish Open took place the same week at Gullane.So are you in the mood to play some golf and book a short golfing trip before the Season ends as we continue to have stunning weather. For St Andrews it is perfect for a golfing getaway and with the St Andrews Links Winter package you can enjoy three rounds of golf at a reduced rate. Hawkswood Country Estate is just 7 miles/10 minutes outside St Andrews. The unique offering with this accommodation is your very own private short golf game area and driving range. Two houses which comprise of 5 bedrooms in each can accommodation groups in single, double or twin accommodation. The Owners also run a B&B – Bowhill House on the Estate for overflow rooms with 4 stunning en suite bedrooms. Edgehill is in Gullane on West Links Road and overlooks the golf courses and a few steps away from the first tee. 7 beautiful bedrooms and an indoor swimming pool is just the treat to relax those muscles after a day of golf. All properties have availability and rates open to end of 2019. So Wimbledon is over for another year and Angelique Kerber takes the Ladies Wimbledon title 6-3, 6-3 win against Williams. After the long and tense men’s semi finals we were glued to every minute watching Novak Djokovic win his fourth Wimbledon title beating Kevin Anderson. Being a fellow Scot (yet not related! )I was delighted to see Gordon Reid and Alfie Hewett win their final 6-1, 6-4 against Joachim Gerard and Stefan Olsson. So does this now encourage everyone once again to hit the tennis courts! Then why not book your own exclusive use property on the outskirts of Edinburgh and have your very own private tennis court. At Carlowrie Castle you have exactly that along with 9 stunning en suite bedrooms. For more details on Carlowrie Castle and the stunning facilities we have to offer. What a stunning and successful Aberdeen Standard Investment Scottish Open in the beautiful East Lothian, Gullane . Won by South African Brandon Stone broke the Gullane course record with a final round of 60 to win the Scottish Open by four shots. Stone, 25, almost became the first to score a round of 59 on a European Tour, missing a birdie putt on the 18th. “The first time I knew I had the opportunity [to score 59] was when I was walking on to the 18th green,” he said. There have been 28 previous rounds of 60 in a European Tour. “The attitude was spectacular all week – my caddie obviously kept me very calm and level headed, not only today but the entire week.” Stone’s eagle on the 16th was the highlight of his round as the course record was broken for the third time this week. So how about you visit East Lothian and see what scores you can achieve and stay at the stunning Edgehill, the newest exclusive use property to launch onto the market place overlooking the links course. Candacraig in the Scottish Highlands is a wonderful base for groups sampling the best of Scottish Whisky. Visit some of the best local whisky distilleries then return to Candacraig for a dram in the whisky library or round and bonfire. Standing the Test of Time From its hillside home in the Scottish Highlands, The GlenDronach Distillery has been creating the finest richly sherried single malts for nearly 200 years. In 1826 the exuberant and extroverted James Allardice founded the distillery and produced his ‘Guid GlenDronach’ single malt. Down the years, the distillery he created has thrived under the stewardship of far-sighted investors like Walter Scott in 1847 and Captain Charles Grant in 1920. In more recent times, GlenDronach was bought in 1960 by William Teacher & Sons. But in 2008, nothing less than a complete renaissance began. After Breakfast we head into Speyside for our first of two visit’s of the day, Glenfiddich & Balvenie Distillery’s (It has taken over 125 years and 5 generations of family ownership, passion and drive to ensure Glenfiddich is the most-awarded Single Malt in the world today). This in-depth 2 and half hour visit will allow enthusiasts to discover the true art of whisky making. (Lunch in the Glenfiddich Restaurant) Balvenie unique single malt. Thanks to a unique combination of natural alchemy and centuries old craftsmanship, The Balvenie is unique among single malts. For the Explorer/ Draw your own Dram Tour, for me this is one of the Must-Do Distilleries. The distinctive character of Glenfarclas Single Highland Malt Scotch Whisky, for which only three essential ingredients are required; pure spring water, malted barley and yeast, is due to the Grant family’s commitment to traditional distillation methods, combined with the unique size and shape of the Glenfarclas copper pot stills, the specially selected oak casks, and the style and location of the warehouses. after our visit we head north towards Elgin for your next Malt Whisky Experience BenRiach. In April 2004, 3 entrepreneurs, led by Scotch whisky industry veteran Billy Walker, acquired the distillery, which was previously under the ownership of Chivas Brothers. The BenRiach Distillery Company was then born. Now BenRiach, located in the ‘Heart of Speyside’ – just south of Elgin, is once again producing its very special Single Malt Whiskies…as an independent distiller. The distillery manager would oversee the slow and deliberate crafting process of BenRiach whisky – managing the transformation from malted barley to wash, to distilled spirit and into high quality oak casks, in which the whisky would then mature. This was the beginning of the BenRiach Whisky. So now you have access to a selection of some wonderful properties to hire for that special party, what games do you plan? ..to name just a few. The Scottish Open (known as the Aberdeen Standard Investment Scottish Open) is a golf tournament on the European Tour. Since 1987 it has been played the week before the Open Championship and has been the last chance to qualify for the championship. It has been part of the Open Qualifying Series since that series started in 2014. The leading 3 or 4 players, not already qualified, have received an entry to the Open. Before 2014 there was generally an exemption category so that the leading player or players, not already qualified, could play in the Open. This July, 2018 the Scottish Open comes to Gullane, East Lothian and we will see if Rickie Fowler from the USA will win again in Gullane as he did in 2015. More generations of families from all over the World are choosing to travel together for Summer vacations, a special celebration or simply to get away from it all and spend time with family. Three-generation holidays are on the rise: two thirds of you have tried it, according to a new poll 20% of Britons are already holidaying regularly with grandparents, parents and children. This is no surprise as it is a great way to spend time together with something which appeals to all. Perhaps even do a tour flying into Glasgow and driving to Loch Lomond then onto Loch Tay, round by Perthshire and finishing near St Andrews before flying home from Edinburgh. Self-catering holidays remain the most popular and price comparison to hotels for families is by far a more cost effective way of travel and as a result many families can choose grander and larger more luxurious properties as their money goes further. So contact Susan Reid Collection for your next family vacation. White knuckle rides might help slow aging…. At Stucktaymore you can experience exclusive use luxury accommodation for small corporate or family gatherings. Overlooking the beautiful Loch Tay there are a wealth of water sport activities on offer in the breathtaking surrounding countryside. Have a look at the Stuckgowan Estate Collection of properties, exclusive use five star accommodation on the banks of Loch Tay and surroundings of Loch Lomond. From September 9th – 15th Gleneagles will be at the centre of the golfing universe and watched by millions around the world as the biennial contest re-visits the ‘Home of Golf’ for the first time since 2000. Why not make use of Hawkswood’s Solheim Cup, Gleneagles Package? An exclusive use golfing package offer at the five star Hawkswood Country Estate which includes Hawkswood House, The Roundel and Bowhill Bed and Breakfast. Double bedrooms, a maximum of 28 persons. Twin bedrooms, a maximum of 26 persons. Single bedrooms, a maximum of 14 persons. Return transport from the venue. Please note we have a landing area for helicopters. Or one additional return local trip e.g. into St Andrews for dinner and back to the estate for 9pm. What is the best whisky and food pairing. There is even one renown to go with a bacon sandwich. Candacraig whisky library is the perfect setting to sample all malts and their Private chef will match them with delicious and breathtaking cuisine. Why not book a wee gathering? Candacraig is the perfect exclusive use luxury Estate in a private a Highland setting in the Cairngorms. The language of Scotland isn’t easy…. 3. Historic crowning place of Scottish kings: Kenneth MacAlpin (said to be the first King of Scots), Shakespeare’s Macbeth and Robert the Bruce are among the 38 monarchs inaugurated at Scone. Scone Palace is a splendid five star exclusive use accommodation steeped in history. 26 guests can be accommodated for exclusive use. Dinner may be served in the State Dining Room, which seats 12 to 24 persons around the table made for Queen Victoria’s visit, The Long Gallery, where up to 110 persons can be accommodated, or within the Murray Suites, which accommodate 50 guests. It is the perfect historic setting for all your corporate events. The secret to a great event…. … Find a great space steeped in history. 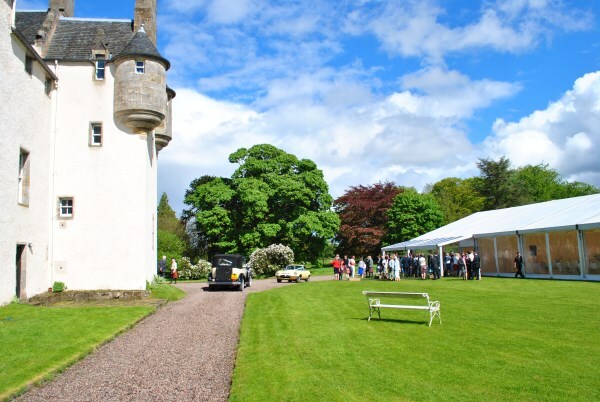 This makes Carlowrie Castle the perfect setting for Exclusive use events. A beautiful setting; can cater for lunch and activities only for exclusive use and also dinners only for up to 100 with exclusive use. The perfect venue for team building events from cookery lesson from an award winning chef to tennis to name but a few. It’s always so good to get the family together…. Try these games and get the whole family moving. We have a great offer on the Hawkswood Country Estate, with it’s private short game golfing, terrace balconies, hydro spas and exclusive use of all 3 properties now on the Estate it is the perfect family getaway. It has14 bedrooms capable of accommodating 28 guests. Make some memories. No plane required. Just hop on into a Landrover. Did you know Scotland is home to a host of wonderfully diverse species, from birds of prey and land animals to sea life on the nation’s coasts? We have the perfect base. Stucktaymore is an affordable exclusive use accommodation, perfect for parties and family gatherings and holidays for all the family, a beautiful Loch Tay location, so many activities on Loch Tay and surrounding area. Sheep herding is the new team building experience on the block? Sheep herding. Now, you can even now do ‘human sheep herding’ – just in case you don’t trust your staff with the animals. Carlowrie Castle is an exclusive high end property ideal location to Edinburgh airport and city centre. Steeped in modern luxury aimed at corporate, incentive market and high end leisure market. Lunch and activities and also dinners only for up to 100 only for exclusive use. Last weekend I had the pleasure of attending the #LLLUXBLOGFEST at 3 St James Square in London. I was lucky enough to win tickets to the event by entering a twitter competition. Usually the tickets would cost £50 per person. Susan Reid Collection – Another travel related one… If you are looking for a luxury getaway or venue in Scotland, look no further! Susan Reid has plenty of them to offer… She has variety of beautiful venues that she works with and offers her customers a bespoke service by finding their perfect venue, in their ideal location, at their required price. She is the perfect person to contact if you are planning a Scottish wedding, hen do or just fancy treating yourself to a little weekend break in a castle! I have never been to Scotland, but have always wanted to go, I will definitely be in touch when I start planning a trip there! Scone Palace I have worked for a while now and wanted to remind you for the catering and event options they provide. From tours with lunch and afternoon tea to a gala dinner setting from 20 guests to 110. For details on their hospitality options email me and I can send further information. To view all exclusive use properties my brochure is http://www.susanreid.co.uk/Susan-Reid-Collection-21_09_17.pdf and hope I can be of assistance in the near future. Clients dream of team experiences that are unforgettable in locations that are truly stunning. And so The Fresh Air Learning Company is delighted to partner with Susan Reid to offer the opportunity to train and operate as a mountain rescue team in the Scottish Highlands. With Stucktaymore on the banks of Loch Tay as the team base, you will undergo a rapid induction programme as a mountain rescue team that will prepare you for the moment you are tasked to go “operational”. Experienced Scottish Mountain Rescue personnel will support you all the way. Our people are experience business leaders as well as expert facilitators of outdoor learning experiences. We understand how important your investment in time and resources is, and we will work closely with you to design the experience that delivers the outcomes you seek. Three exclusive use venues with stunning loch-side views have been launched under the Susan Reid Collection. Stuckytaymore, a sprawling 13-bedroom house overlooking Loch Tay in Perthshire, is available for hire for the corporate and private hire market as of July this year. Stuckgowan, a grade A listed building which dates from before 1820, is a nine-bed property overlooking Loch Lomond in the Trossachs National Park and Stuckdarach, a grade B listed building situated in the grounds of Stuckgowan has been restored from a derelict state into a ‘contemporary’ six-bed retreat. All feature flexible spaces for conference and board room meetings and can cater for private banqueting and receptions; they all have usuable outdoor space for terrace BBQs, extensive grounds for activities and luxury-feel bedroom, kitchen and communal areas. Susan Reid, who represents some of Scotland’s most stunning private houses, venues and castles for hire, said: “These are very special properties. I love working for owners who put a personal touch into the redevelopment and decor of their properties and all three of these beautiful houses have been restored and fitted out to the highest possible standard. They’ve been renovated throughout and feature jacuzzis in the garden; they’ve also got extensive grounds, which are ideal for activities, especially for the corporate team-building market. The properties will be promoted to the UK short stay and business events market, as well to the international corporate market; nearby there are activities including watersports, horse riding, 4X4 driving, fishing, golf and country sports. The venues are owned by a private family with a background in the pharmaceuticals industry and have been purchased at various times since 2011. For information and pricing inquiries contact Susan Reid. Here at the Scotch Whisky Experience, we are often called upon to lead private or bespoke whisky tastings for family groups or business clients who want an event that’s a wee bit special. Many people don’t realise that different Scotch whiskies will go perfectly with various foods, it’s just about getting the flavour profiles and balances right, something our Visitor Assistants and Bar staff are highly trained at doing. You can even try a tailored food and whisky matching tasting session, with canapes provided by our award-winning Amber Restaurant team. “One of the most enjoyable facts of whisky is being able to match each and every one of the ‘amber nectar’ brands with an array of different food. Most recipes concentrate on the traditional three course meal – starter, main and sweet, with delightful desserts ranging from sharp and creamy cranachan to the heaviest stick toffee pudding. But have you ever thought of straying away from that tradition? Chocolate, yes that addictive pleasure, makes a perfect match. Now, those who are aware of this delicacy seems to be drawn to expensive truffles or high-end chocolate with at least 60% cocoa content, and undoubtedly, a good dark chocolate with a body melt of 15 seconds, washed down with a perfect Scotch will leave you with a blanket of contentment. Not everyone has the means to enjoy both of these pleasures together, so I’ve compiled a more accessible match by selecting a few cornershop confections that go beautifully with a dram of your favourite whisky. First to tingle the palate is Balvenie Doublewood with a Cadbury Crunchie. The Doublewood is a sweet, mellow whisky with honeycomb notes which mingle perfectly with the classic honeycomb and chocolate combination that’s so famous for giving ‘that Friday Feeling’. Dalmore’s 12 year old single malt whisky should be enjoyed with a Terry’s Chocolate Orange, its concentrated citrus aromas drawing to the fore deliciously dark, thick-cut marmalade. Deanston’s 12 year old single malt goes wonderfully with dark chocolate gingers – the whisky brings out the tingle of the ginger on the tongue, whilst the dark chocolate mellows into the whisky. Heaven is summed up in a Glengoyne 12 year old Scotch whisky matched with a Cadbury’s Caramel, which compliments the whisky’s natural smoothness and flavours of toffee apples and cinnamon spice. The light-bodied Scapa Skiren, full of flavour with hints of coconut, pairs up perfectly with a classic Bounty Bar. A Glenmorangie Signet, made with roasted chocolate malt which gives natural chocolate and coffee aromas, mellows beautifully with Coffee Creams. And last but not least, a Smokehead 18 year old single malt from the whisky region of Islay will pair up nicely with After Eights. Smoke and mint – who would have thought? You’ll notice that the whisky itself has undertones of mint and cloves on the nose, flavours which are highlighted well by After Eight mints. I have many more chocolate matches to Scotland’s beloved whisky, and would love to share them with you. So you see, the perfect whisky tasting experience can be as easy as you want it to be, there’s an option to suit everyone. Enjoy. Candacraig and a love for whisky? Royal Lochnagar Distillery & Visitors Centre – Easter Balmoral, near Ballater, 17 miles (34 min) south. The Royal Lochnagar Distillery is situated on the south side of the River Dee within a short drive of Balmoral Castle. Age old traditions and craftsmanship produce one of Scotland’s most exclusive whiskies (www.discovering-distilleries.com). Booking in advance is essential (www.royal.lochnagar.distillery@diageo.com). The Glenlivet Distillery – Glenlivet, 25 miles (43 min) north of Candacraig. The Glenlivet can only be made in one particular spot, in a single glen, in the heart of Scotland’s malt whisky-making country. Pre-booking required for groups of ten or more (www.theglenlivet.com). Cragganmore Distillery & Visitor Centre – Ballindalloch, 32 miles (53 min) north. Cragganmore Distillery, on the banks of the River Spey, is home to one of the most complex and characterful malt whiskies of the revered Speyside region (www.discovering-distilleries.com). Glenfarclas Distillery & Visitor Centre – Ballindalloch, 33 miles (51 min) north. Glenfarclas is one of the few independent, family owned and managed distilleries left in Scotland and provides a warm welcome in the dedicated visitor centre (www.glenfarclas.co.uk). The Glenfiddich Distillery – Dufftown, 36 miles (57 min) north. Set in the heart of the Highlands, Glenfiddich (meaning ‘Valley of the Deer’ in Gaelic is a place of breathtaking beauty and home to the World’s Most Awarded Single Malt Whisky (www.glenfiddich.com). The Balvenie Distillery – Dufftown, 36 miles (1 hr) north. The Balvenie is unlike all other single malt Scotch whiskies, thanks to a unique combination of human craft and alchemy that has remained unchanged in over a century (www.uk.thebalvenie.com). Strathisla Distillery – Keith, 38 miles (58 min) north. With its distinctive pagodas, cobbled courtyard and picturesque buildings, Strathisla, is the oldest working and arguably the most beautiful distillery in Scotland (www.maltwhiskydistilleries.com). Cardhu Distillery & Visitor Centre – Knockando by Aberlour, 38 miles (1 hr) north. Share the story of the only malt distillery pioneered by a woman at the Cardhu Distillery & Visitor Centre (www.discovering-distilleries.com). Macallan Distillery & Visitor Centre – Craigellachie, by Aberlour, 41 miles (1 hr 4 min) north. In the heart of the beautiful Macallan Estate, personal service and a warm greeting await every guest (www.themacallan.com). Reservation is required for all tours (distillery@themacallan.com). Glen Grant Distillery & Garden – Rothes, by Aberlour, 42 miles (1 hr) north. Enjoy a wonderful and memorable day out at Glen Grant, tour the distillery and Victorian Woodland Garden, and for those too young to tour the distillery, take part in the animal trail (www.glengrant.com). Dallas Dhu Historic Distillery – Forres, 53 miles (1 hr 26 min) north. Discover the whisky-making process in this Victorian distillery now run by Historic Scotland as a museum. Take an audio-guided tour, wander at your leisure through this fascinating building and enjoy a free dram afterwards (www.historic-scotland.gov.uk). Trying to find a unique and special place to stay for that next get together with friends & family, celebration or dream trip to Scotland? Look no further!! Just 8 miles from St Andrews, in the picturesque hamlet of Peat Inn, The Ainscough Family run a family business comprising of 2 stunning properties – Hawkswood House and The Roundel. Both exclusive use properties; Hawkswood House and The Roundel offer five luxurious en-suite bedrooms. Along with two stunning reception rooms including log burners, Hawkswood also enjoys a conservatory with dining facilities, and French windows leading out to the summer terrace. One feature room of The Roundel is ‘The Roundel Room’ itself, a maginificent room with a high conical roof and five huge windows for guests to enjoy the views of the beatiful Fife countryside whilst dining in the evening. Each property is completely self-catering, however you have the option of your very own personal chef to cook breakfast and dinner – if you really want to treat yourself! Both properties also include an outdoor hydro spa and we haven’t even gotten to the best bit yet….each has their very own short game golf area! Not only that, there is a private 250 yard driving range. What golfer doesn’t want this in their back yard? It’s the perfect way to hone your skills before playing one of the many great golf courses in the St Andrews area. This October, The Ainscough Family are excited to be expanding their business with the opening of Bowhill B&B. This will include 4 en-suite super king/zip and link bedrooms, a private lounge, breakfast area and bar for residents. Guests can book individual rooms or the property can be used for overflow rooms to Hawkswood and The Roundel. We are pleased to say that you can enjoy full exclusive use of The Hawkswood, Roundel and the 4 rooms at Bowhill House (equating to 14 bedrooms) during The Open 2018. If you think this is the place to be and are looking to get a group together for this amazing event, please for full details and we can start building your dream trip! PEAT, the whisper of the word feels Scottish. You are suddenly lost in deep, smoky, intense flavours of Scotland’s greatest luxury export – Whisky – preferably a vintage Single Malt, made with grain dried over a peaty fire, then aged slowly in an oak barrel. Speaking of Scottish luxury, there’s a village, around seven miles from St Andrews – the “Home of Golf” – called Peat Inn. There you’ll find an unassuming row of houses, a Michelin-starred restaurant and a new golfing retreat hard to match for exclusivity and comfort. Hawkswood House, The Roundel and Bowhill Bed and Breakfast is a collection of three five-star properties on a secluded rural estate owned by the Ainscough Family. Owner John and daughter turned General Manager Mary-Jo have transformed a derelict farmstead into a stunning golfing getaway for groups with no expense spared. The main dwelling, Hawkswood House, was once a dilapidated stables. The other, The Roundel, a neglected kennels. The transformation is remarkable. The two houses are blissfully private but best of all bordered by a short game practice area for exclusive use by guests. Here you can hit everything from a 60-yard wedge to a chip and run before you head out to tackle any of the seven courses operated by The St Andrews Links Trust. The area was designed by a professional golfer and features a realistic synthetic green and a bunker with authentic white links sand. In a next field across, John built a six-bay 300-yard driving range which opened in Summer 2017. An open and warm character from Lancashire, England, John was responsible for growing Ainscough Crane Hire into the largest lifting services and crane hire company in Scotland. His vision seems to know no bounds. Next on the do-list, alongside the driving range, is a private heli-pad, making it even easier for the rich and famous to drop in for a couple of nights and a round on The Old Course. Edinburgh Airport is only 75 minutes’ drive away and rail services run from London to Leuchars, around 15 minutes’ away by taxi or collection by Hawkswood’s private shuttle service. The place immediately reminds you of the incredible Florida tax-haven homes owned by PGA Tour stars, with their own personal back-yard practice holes and putting greens. The only things missing being the swimming pool and the jetty for the private yacht. I stayed here in March, as part of a University of St Andrews golf team reunion and a 40th birthday celebration. Nothing was too much trouble. Food and wine was delivered in advance and was waiting for us on arrival. There was ample parking for around 10 cars. The properties have 10-bedrooms, five each, and can cater for 20 golfers. Four additional en-suite bedrooms are available at Bowhill Bed and Breakfast. Each is beautifully appointed with an en-suite bathroom, comfortable beds, tasteful décor and toiletries supplied by the White Company London. The communal living spaces are exceptional, with log burners, welcoming couches, flat screen TV’s and a complete Sky package – including that all-important Sky Sports Golf coverage. A room with a view – over the short game zone! The kitchens have everything you could possibly need from steam ovens and microwaves to induction hobs. The array of drinking vessels, from cognac glasses to wine goblets is superb. There are two tall fridge freezers and guests are welcomed with a hamper containing luxury crisps, quinoa couscous, breakfast cereals, fine Italian filter coffee, bread and preserves. Hawkswood House has an open, airy conservatory that is perfect for dining and entertaining and our group held a celebration dinner here for all 20 guests. The properties are seven miles from St Andrews, which makes it a challenge to enjoy the town’s many watering holes at night, however, two Hawkswood Mercedes shuttle buses are available to taxi guests to local golf courses, nearby tourist attractions and into St Andrews of an evening. The properties are lit-up at night which makes you feel secure and able to find your way easily into any property. Hawkswood House and The Roundel opened for business in 2014 and has already attracted famous names to stay. Nick Faldo used it as his base for the 2015 Open at St Andrews, which was to be his last hurrah in a tournament he’s won three times. His spiritual farewell was put in jeopardy when he cut his hand on a set of mounted deer antlers when pulling on his shirt at Hawkswood House. The antlers hang in the main dining room of the house and another set of antlers has been turned into a hanging ornament above the banquet table. Faldo’s Antlers – he always was good at playing with a CUT! His accident probably left him stressed but there are ample ways to relax here. Both houses have a large Hydro Spas and there are also spa-jet baths to ease those aching muscles after a long day on the links. In Summer time, guests can enjoy the Mediterranean barbecues situated on the patio areas outside, as well as the terrace balcony in Hawkswood House which is ideal for evening drinks while a chip-off takes place beneath on the short game zone. There are few properties so well equipped and situated for large golfing groups as this one. Its owners have worked tirelessly and paid attention to every detail to ensure a service and experience that is truly special and memorable. The location, close to so many outstanding links courses in The Kingdom of Fife -read our review of golf in Fife here – is another superb advantage. You can easily reach the links at Elie, Lundin, Leven and Crail or head inland to beautiful Ladybank. There are 36 holes at nearby Fairmont St Andrews resort, The Dukes Course and the seven courses operated by St Andrews Links Trust – including the newest Castle Course. Like the subtle taste of fine Malts – and its peat fired finish – the great luxury of Hawkswood House and The Roundel was hewn from humble beginnings and by moving plenty of earth and dirt. Matthew Moore was a paying guest at Hawkswood House, along with a golfing group of 20, in March 2017. With the experience in Scotland’s hospitality Industry for the last 20 years I am delighted to independently promote my Collection which I carry out the sales & marketing representation and which in my opinion offers a sample of some of the best in Scottish service, quality and hospitality. In order to gain exposure in the market place leading to converted business, I personally feel that companies need to invest in cost effective campaigns and pro active sales and marketing activity to increase their profile and attract potential clients. As a result almost 14 years ago in November 2003, I set up the business following the position of Director of Sales in a number of key city Edinburgh Hotels such as The Balmoral Hotel and Crowne Plaza, Edinburgh (now the Radisson SAS). For my property owners, I take on a pro active sales role which is quite unique in the market place and was one of its first to be launched in Scotland with continued success in the market place today. This allows me to offer the professional skills and knowledge I have gained from larger organisations and assist in the promotion purely of privately owned properties, ensuring their awareness is strong in the corporate, leisure and incentive market place. This can only be achieved by concise and pro-active sales and marketing strategies of which they are carried out by myself alone. The work which is carried out by myself is undertaken by means of research calls, sales appointments, presentations and show rounds of the property to the target market base. This is how and why I have built up such an excellent client following and trust with buyers worldwide. Is it every too early to talk about Christmas and New Year? Hawkswood House and The Roundel are exclusive use 5 star properties set in the picturesque hamlet of Peat Inn, just a few miles from St Andrews. Beautifully appointed and sumptuously equipped to appeal to the most discerning of guests. You can now unwind in our new Hydro Spa, with room for all. It offers 43 state-of-the-art jets that relieve-tension in targeted areas and a perfect way to relax and unwind. Both properties have their own Hydro Spa. If you wish to dine out, the renowned restaurant the Peat Inn is a short distance, and St Andrews offers a wide choice of both fine and casual dining. A chef can be arranged in advance if you wish to dine in the house or an advanced food shopping service is available. Our Shuttle bus service available on request, please ask for details at the time of booking. CONSIDERING SCOTLAND THEN LET SUSAN REID COLLECTION MAKE IT HAPPEN FOR YOU…. I am delighted and privileged to work with some wonderful owners and their properties in Scotland. When it comes to exclusive use this is my passion and tailoring a group or family’s itinerary to really appreciate and experience all Scotland has to offer – fishing, golfing, shooting, walking, castles, gourmet food, whisky, gin, cashmere, tartan – to name just a few. I promise you affordable luxury and experience with the Susan Reid Collection – The luxury hospitality specialist. Sandra Murray is a world-renowned Scottish couturier. Over the course of a remarkable career she’s created designs for a host of international clients and brands. Her patrons include Gaelic singer Julie Fowlis – who sang the theme song to Disney Pixar’s oscar-winning animated film Brave – and the Queen. We’re delighted to be able to offer our guests face-to-face events with this unique artist. Sandra’s know-how, knowledge and experience will be at your disposal, offering a fascinating insight into the inspiration and inventiveness behind her distinctively hebridean yet cosmopolitan approach to fashion. At the same time Sandra can create a bespoke garment especially for you. Whether ballgown, frock coat, cocktail dress or virtually anything in between, it’s the opportunity to mark your stay at Candacraig with a timeless, artisan creation that’s uniquely yours. – the perfect reason to get all the family together in your very own exclusive use property. Visiting Scotland for the first time or returning home if living overseas and spend quality time with the family. All year round to Christmas and New Year holidays, all my properties for Exclusive Use provide the memorable settings. A range of activities and entertainment can be provided to ensure all ages are catered for from the grand-parents to the grand-children. All are welcome. Susan Reid Collection offers a range of properties perfect for a group of friends arranging a get together for a holiday or special occasion. Take exclusive use of your very own property such as Hawkswood House & The Roundel near St Andrews with their own golf practice area for a little competition amongst friends in the evening or better still, relax in our luxury hot tub with a glass of fizz. Looking for the ultimate retreat and escape then Candacraig offers a remarkable setting for a group of friends. After a delicious dinner prepared by your private Chef, dance the night away in the Drawing room with our ceilidh band or enjoy a dram or two in the Whisky Library. Plenty options available, just contact to arrange meeting and discuss further your special event. Every now and again I need to take a moment and enjoy the wonderful experiences I am fortunate enough to enjoy with the Susan Reid Collection. One such experience took place over the weekend when I was delighted to welcome our first Chinese delegation to Scone Palace for the weekend. I was invited to join the group on the Friday evening when our Chef had prepared a tasty Chinese banquet before they sat down to watch Braveheart over a dram! It is not every Saturday morning you then rise to a stunning view and wake up in Palace! Warm, welcoming and wonderful comforts experienced by all our guests having a restful nights sleep before waking early to our Full Scottish Breakfast. Our guide Jenny then provided a memorable private tour of Scone Palace in the morning all of which was enjoyed by our guests as they hung on every word to hear the next wonderful story she had to tell! Following the afternoon conference guests prepared for their last night dinner with guest of honor Lady Mansfield. It was wonderful to see the guests enjoying the kilts along with our memorable taste of Scottish Hospitality. We look forward to welcoming the next delegation very soon. I am very fortunate to work with some of Scotland’s most stunning exclusive use properties and their wonderful owners. This is why I am so positive about corporate companies bringing their team to experience what we have to offer in such a collection of properties. We tailor each program to work around all budgets and no group is too small. What ever the occasion you know it’s always better when the place is your very own…. What in your mind makes your venue different from others? No1 whisky, No2 location and No3 our team. As Edinburgh’s whisky home and the custodians of the world’s largest collection of Scotch whisky the point of difference has to be in the internationally acclaimed product which is know in all corners of the globe and is a “must do” when in Scotland. Our location at the top of the Royal Mile, in the heart of Edinburgh’s old town world heritage site brings a whole sense of history and heritage to the arrival. In addition you are afforded great views of the city from our Blender’s Room and McIntyre Gallery. Finally our team love what they do, love whisky and can’t help infusing every visit with their passion for this fabulous product. This is really the cherry on the top to create lasting memory at our events. In your opinion what are some of the best experiences to enjoy when visiting Edinburgh? Making the most of town and country is in my view the most unique aspect to Edinburgh. Combine cosmopolitan dining and drinks with history and heritage in the galleries, museums and attractions and enjoy the coast, hills, rivers and countryside all within the compact city. This what makes Edinburgh vibrant and relaxing, energising and restorative all in one breath. What whisky from Scotland would you say a visitor must try? You have to take the time to be guided to fine your whisky. There is one for everyone and with some time learning about the varied flavours and characteristics you’ll find one that suits your palate. It might be served straight, as a cocktail, matched with food – who knows? There is nothing more personal and subjective that your own tastes so there is no “best whisky” and that’s what keeps out 120 malt whisky distilleries going! What dish with whisky from Scotland would you say a visitor must try? Personal favourites are fish and seafood, especially scallops. What motivates you in this industry? One of the main aspects is working half and half in two different industries: Whisky and Tourism. Both are cornerstones of the Scottish economy, both cover every region of Scotland and both are full of people who love what they do working together for a greater good. I always feel that there is a balance and harmony to these two aspects; whisky producing a huge volume export from Scotland to the rest of the world providing one of the many hooks that then brings visitors in their millions from the rest of the world into Scotland. An ebb and flow with each bottle of Scotch containing an invitation to seek out its origins. I am delighted to work with the family who built and own Hawkswood House & The Roundel, two exclusive use properties outside St Andrews. Question: What in your mind makes an exclusive use property different from a hotel? A hotel is a bit like a conveyor belt. With an exclusive use property guests receive a personal touch and their own private space without bumping in to anyone else. You go that extra mile for your guests to make sure that their expectations are exceeded and that they have a wonderful experience. Question: In your opinion what are some of the best experiences to enjoy when visiting St Andrews/Fife area? That’s hard because we are very lucky to have some amazing experiences from food to taking a boat to the Isle of May. I would have to say a distillery tour, Scotland is very passionate about their malt, it’s a unique experience. Question: What dish in Scotland would you say a visitor must try? It has to be haggis! You can’t come to Scotland and not try it. Question: What activity in Scotland would you say a visitor must try? The best activity has to be walking the Fife coastal path and it is free! The path stretches for many many miles but you can do small sections at a time between fishing villages. The scenery is breathtaking, you feel like you are in another world, it’s simply stunning. Question: What motivates you in this industry? The feedback from our wonderful guests, not just about our five star accommodation but the love for our country. We get to meet guests from all corners of the globe and they all say what a beautiful country we have. Scotland is an amazing place and we are very blessed to be here. Many clients have spoken to me over the years who are new to Sales & Marketing Representation and presume I am an agent. Well I am here to tell you I am not and how does Sales Representation vary from an agent? I work for key properties doing the role of a sales person instead of them recruiting personnel internally. I work with and in addition to any in house teams. I am pro-actively working to gain further awareness on only specific properties and venues. When I take an enquiry I can only and do only, quote a property that I represent the sales representation for. Unlike at agent who has acts for no specific property. Sales & Marketing Representation does not work on a commission structure which enables me to sell to many agents and they retain all the commission. There is a greater loyalty for a particular property as my reputation in the quality of product and service they offer reflects a greater deal on my business. Sales Representation can be done by way of maintaining the property branding for example having their company email in order to respond to clients under their logo. And lastly carrying out sales & marketing representation requires creative ideas and always thinking out of the box for my clients. Nestled in the heart of the Scottish Highlands, Candacraig is an inspiring, exclusive retreat and a wonderful placwe to create some festive memories or see in the New Year. Steeped in history and surrounded by the wild beauty of the Cairngorms in the Scottish Highlands. Originally built in the 17th century, Candacraig House was enlarged in the Scottish baronial style with its pepper pot turrets and crow stepped dormer windows in 1836. It has been extended several times over the years and was reconstructed in 1955 retaining its Scottish style. The current owners Lynne & Marc Lino bought the property last year from Billy Connolly a famous comedian/actor and have since placed considerable investment into this stunning property. Guests enjoy exclusive use offering 12 bedrooms, an impressive formal Dining Room, Drawing Room, Games/Billiard Room, and a Whisky Library that through many years of collecting provides a leading selection of single malts. Outdoors, guests have full access to 18 acres of private woodland and manicured lawns, including a large Victorian walled garden, a lochan fed by the celebrated River Don and a woodland bonfire area – a very special spot to enjoy a warm drink by the fire. Exploring the lavish grounds you will find one magical setting after another – exclusively yours to enjoy during your stay. For the Festive period we can assist in arraning any entertainment and catering or for a rare opportunity guests can self-cater in this stunning Castle. What in your mind makes a private members club different from a hotel? A private members’ club has that unique characteristic that generally seeks to enhance the visiting members experience, be they using the Clubs’ facilities for working, dining, meeting or staying overnight. The member, who after all is paying an annual subscription to “belong” does so, so that he or she can guarantee the experience they expect. Whilst commercial profit is very important it is not the only thing that counts. There is always a good atmosphere of conviviality in a members club, especially when members will go out of their way to make others feel at home. In your opinion what are some of the best experiences to enjoy when visiting Edinburgh? Go underground and visit the city under the city at Mary Kings Close, watch an International game of rugby at Murrayfield and climb Arthurs Seat. What dish in Scotland would you say a visitor must try? What drink in Scotland would you say a visitor must try? There is a growing selection of micro-breweries producing some excellent ales as well as increasing options for differing gins, both alternatives to the traditional malt whisky! What motivates you in this industry? Meeting financial targets by ensuring that members and guests expectations are met and working with and helping to develop a good team of staff. Lynne Lino: Exclusive use means privacy, personalised service, attention to detail, bespoke, above and beyond – all words you won’t get whilst hosting your event in a standard hotel. Question: In your opinion what are some of the best experiences to enjoy when visiting Aberdeenshire/Royal Deeside? Lynne Lino: The activities are endless. From the many whisky distilleries and over 50 golf courses to private food tours, castles and just about any outdoor pursuit you can dream up. Lynne Lino: Haggis! if you don’t fancy a real one there are vegetarian ones running about the hills. Question: What drink in Scotland would you say a visitor must try? Lynne Lino: the obvious choice is Whisky but it isn’t for everyone so it would be a missed opportunity not to try the many fantastic Scottish gins on offer from all parts of Scotland. Personally, I love the Botanist, or Caorunn made with the beautiful botanics of our fabulous country. We also have some of the purest water on earth. Speyside Water or Deeside Water are just over the hills from us, and I challenge anyone to find a more perfect water fresh from the stream. I was delighted today to again meet with Petra Wetzel over lunch at The Royal Scots Club and learn more about this fascinating business woman. We are delighted she will be our second guest speaker of the Liaison Lunches series at The Royal Scots Club and I look forward to her talk enormously on Thursday 10th November. What got you started in the Brewing Industry? German-born Wetzel, 38, and her father Herbert, an engineer by trade, famously coined the idea for a Scottish “Bavarian-style” brewery while having a drink in the Ubiquitous Chip in Glasgow in 1994. Something of a beer connoisseur, he ordered a pint of Tennents, took a sip and winced. “He asked me what the best Glasgow lager was and I realised I didn’t know,” she recalls. “In Germany every village and town has a good brewery. It’s something people are proud of and want to show off to visitors. He couldn’t believe that a city like Glasgow didn’t have its own brewery.” The brewery went into administration in 2008 when I was working in a law firm so I took the decision to leave that job and buy the business back as I did not want to see it end. Almost two decades later, housed in the historic former Templeton Carpet Factory, is the product of that light bulb moment. Do you feel the Brewing Industry is very male dominated and how did you find being a female in this industry? It used to be more of a male dominant industry but not anymore. I think personally being female, German and knew nothing about beer was an advantage for me and made me unique. It works in my favor as we do things differently and people remember me. My son and money to have nice holidays. Also making a difference and touching people in such a way we deliver then a nice meal, good pint and they enjoy the experience. Would you recommend the Industry to others and in particular young people? Yes 100% as it is fun, creative and offers excellent job opportunities as you can take beer all over the World. I would especially like to see more women enter into the industry. Who would you most like to see drinking your beer? I was delighted to meet with Sandra Murray MBE – designer/couturier/artisan as we discuss ways in which to collaborate for guests visiting and staying in my Castle Collection. Question – What led you into the fashion world? Creativity is in your genes and it evolves like a lifelong journey or a work in progress affair. I was always drawn to hand sewing, lovely fabrics, embroidery and textile related subjects…I love texture and colour…that’s my palette as an artist. My Dad was a boat builder and my Mum had a knitwear business…so I come from a technical orientated family but with creativity running through its veins. Question – What is your most challenging experience today? For an artist to make money selling their work is a huge challenge….which is why there is a huge failure rate and faced with money troubles . Usually creative people aren’t driven by money, or even good at it, so they need that expertise if they wish a serious business, regardless of scale when they have a micro business. Having to do a huge amount of travelling is challenging too, takes up a lot of time with living and working in the Highlands, when your market isn’t largely local. However that’s become my USP in recent years. Question – What is your most proud experience to date? It would have to be my Royal Commission from HM The Queen for the Opening of the Scottish Parliament in 1999, and currently on display at Holyrood Palace as one of her Scottish Inspired garments. Question – How would you suggest a young person get into the fashion world? Work is about networking and making the right contacts. Select which area you want to concentrate on and create your own path to the destination….some things wont go according to plan but then other surprises turn up en-route. All things make sense in hindsight! Who would you most like to see wearing one of your pieces? I admire Michelle Obama’s sense of style. You see the true essence of someone comfortable with who she is and always radiant. I also admire Tilda Swinton’s androgynous style. You may notice, I’m not using the word fashion. Hawkswood House and The Roundel are exclusive use 5 star properties set in the picturesque hamlet of Peat Inn, just a few miles from St Andrews and perfect accommodation for a golf outing. After your game of golf guests can unwind in our new Hydro Spa, with room for all. It offers 43 state-of-the-art jets that relieve-tension in targeted areas and a perfect way to relax and unwind. Both properties have their own Hydro Spa. Our Short Game Area was designed and built by a golf professional, to provide the perfect practice area for honing your short game. If a warm evening enjoy dining al fresco with our impressive Mediterranean BBQ and outdoor patio area. Guests receive a Welcome hamper on arrival which includes Milk, orange juice, butter, cheese, Cereal, crisps, wine, oat cakes, biscuits, bread, crisps, jam and Fruit bowl. Being an exclusive use property you can bring your own beverages at no charge. We can also arrange a full shopping service for your arrival with the fridge stocked with food, wine and beer. Another major benefit to our properties is our 16-seater mini coach which can take guests to your chosen Fife Golf Course or into St Andrews up until 9pm at night with a nominal charge. We require 48-hour notice for all bookings of the coach. The coach is offered on a complimentary basis for stays of 3 nights or more. Subject to availability and minimum night restrictions apply. What got you started in mountaineering? When I was 17 I went on a school expedition to Kenya. On the trip we went on Safari, we did some charity work and at the end had the chance to climb Mount Kenya. It took four or five long days of walking uphill. When we finally reached the summit and we were standing above the clouds I felt amazing. I was hooked. And I knew mountaineering was something I was going to do for the rest of my life. Throughout the rest of school and university I would save up as much money as I could in the term time and spend it all on an expedition over the summer. I traveled to the Himalayas, the Andes of South America, the Atlas Mountains of North Africa, back to East Africa and closer to home on the Alps and the mountains of the UK. 2. Do you feel it appeals to all ages and both men and women? There is no doubt that mountaineering is a male dominated sport. It is all about having an ability to suffer, to keep going when you are tired, cold and scared. Maybe things that traditionally appealed to more men than women. But women’s participation is definitely on the rise and every time I go on an expedition I seem to be joined by more and more women. It is a great thing, women can get so much out of climbing mountains. 3. What motivates you to go mountaineering? It makes me feel alive. Being in harsh, demanding environments but coping with it, overcoming it and achieving your objective is an amazing feeling. But also the views…. The higher you climb the more incredible the views become. Watching the sunrise over the whole world on the summit day of Everest was the most beautiful thing I have ever seen. 4. What has been the toughest challenge when mountaineering? In 2012 I joined an expedition team to summit Mount Everest. The expedition was two months long with the first 5 weeks yo yo ‘ing up and down the mountain to attempt to acclimatize to the extreme altitude. This expedition pushed me mentally and physically further than I had ever been pushed before. We suffered everyday for two months. But finally on the 19th May we reached the summit. I was 21 years old and became one of the you the youngest British climbers to ever summit Everest. 5. Would you recommend others to try? Absolutely! Mountaineering has given me so much. It pushes your comfort zones and outside of your comfort zone is the only place you can really learn and grow. Plus, the views from the summit are well worth the challenge of getting there! Join us for lunch and enjoy listening to a series of inspirational speakers on a range of topical subjects at the Royal Scots Club, Edinburgh. Only £20 per person per date which includes a welcome drink & lunch. An Iconic Home for Tartan…. The Susan Reid Collection provides exclusive access to some of the finest properties throughout Scotland. From luxury houses, unique venues to stunning castles, she has them all. Having spent many years delivering luxury hospitality services she is well equipped to know before the client does exactly what their wants, desires and needs are. So for Prickly Thistle, we think Susan has a real tartan gem in her portfolio that we have to share with you all, and its Candacraig House…. This property is steeped in history, starting before the actual house as we know it was built. The Lairdship of Candacraig was officially granted in 1620 to the Anderson family. The estate remained with the Anderson’s for 10 generations, and only being sold in 1866. Before is was sold Candacraig House was enlarged in the Scottish Baronial style much of which it retains today. Skipping onto 1998, Billy Connolly and his wife Pamela Stephenson purchased the property from Anita and Gordon Roddick, the founders of the Bodyshop chain. As you can imagine, the estate attracted much media attention during Billy’s time of ownership. Many Hollywood celebrities became regular guests and were always tempted to wear a bit of tartan during their visit. However the tartan obsession comes into its own when you walk into the formal dining room of Candacraig. There is not much within that stunning room that is not covered in tartan, walls, roof, floor, even the great banqueting table and chairs. And before you ask, yes the co-ordination of the tartan designs is in a typical Billy style! We wonder if he would feel right at home at the Thistle Design Studio…. 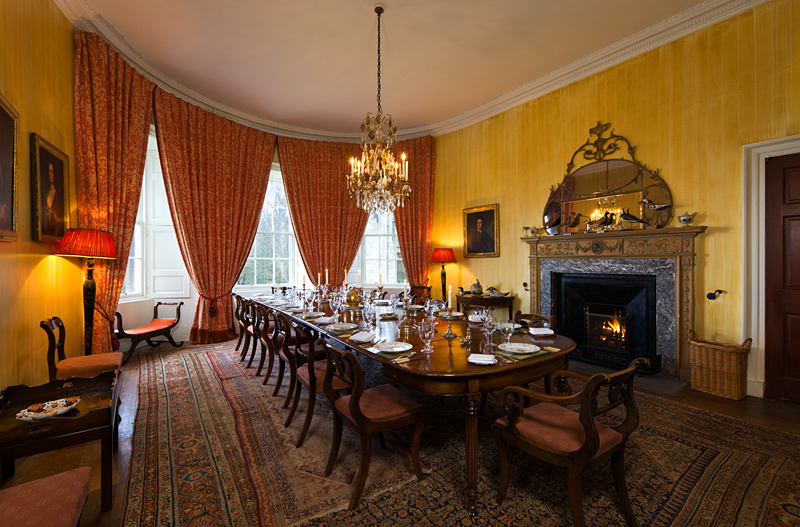 Today Susan can provide clients with a never to be forgotten experience, with is impressive formal dining room, drawing room, games room, whisky library, 12 stunning individually decorated bedrooms and that does not cover the beautiful grounds that the property sits in. Guests have full VIP access to the 18 acres of private woodland and manicured lawns. For supper, guests can roam through the large Victorian walled garden, gathering accompaniments for the meal ahead. Of course not to forget the private Lochan fed by the River Don where a few trout swim by. For full details on her property collection www.susanreid.co.uk you will not be disappointed! Hill of Tarvit Mansion – owned by the National Trust of Scotland, this Edwardian mansion has a fine collection of antiques, furniture and Chinese porcelain as we as paintings by Sir Henry Raeburn, Allan Ramsay and Dutch masters. Scottish Deer Centre – Set in 55 acres of the Fife countryside around Cupar and boasts 14 species of deer from around the world, a wolf pack, otters and wildcats. It also hosts the Raptor World Bird Prey centre. St Andrews Aquarium – boasting one of the finest coastal locations in the historic town of St Andrews, the aquarium is home to British sharks, lobsters and lionfish, as well as poison dart frogs, piranhas and seals. Scottish Fisheries Museum – This fascinating museum at Anstruther harbour, complete with shop and tea room, it tells the story of how through a process of innovation, the Scottish fisheries became such an important part of the lives of so many Scots. Crail Pottery – set around a beautiful courtyard in the heart of historic Crail, Crail Pottery produces a diverse range of stoneware, terracotta planters, raku and bright hand painted earthenware. Kellie Castle – dating from the 14th century, the National Trust’s Kellie Castle has magnificent plaster ceilings, painted panelling and fine furniture designed by Sir Robert Lorimer. There is also an arts and crafts garden. And of course golf – the plethora of magnificent golf courses in Fife make this a paradise for any golfer. Treat the team – reward – tailor made program in exclusive use…. I am very fortunate to work with some of Scotland’s most stunning exclusive use properties and their wonderful owners. This is why I am so positive about corporate companies rewarding their team with the experience we have to offer in such a collection of properties. Exclusive Use – Why it works! Candacraig, a stunning exclusive use property in Aberdeenshire and part of the Susan Reid Collection have just launched their new marketing video which is excellent. Giving the consumer a taste of the area and the wonderful facilities Candacraig has to offer on their arrival. On researching it states that online video users are expected to double to 1.5 billion by 2016 and 76% of marketers are now planning to use video as part of their online marketing strategy. Video is becoming one of the most important marketing tools for tourism and properties. It builds credibility, conveys information better and much faster than text and most importantly in this growing world of social media it’s infinitely shareable. As a result it hopefully drives traffic to your web site which therefore ultimately increases new opportunities and converted bookings. If a picture paints a 1,000 words then this is definitely the way forward and sincerely hope our clients like the new stunning video of Candacraig. I am delighted as part of the Susan Reid Collection to represent the sales & marketing for the Scotch Whisky Experience on Edinburgh’s historical Royal Mile. This past weekend, I was fortunate to sample this wonderful experience in booking the Silver Tour and what a wonderful experience this was. Simply the best in Scottish service and hospitality I am delighted to say. We were met at the reception and guided onto the Barrel Tour which is a 10 minute ride taking you through the crafting of whisky. Following this you are shown into a room to learn more about malts and blends from some of the staff’s most experienced, enthusiastic and knowledgeable staff. At this stage through a sniff test you discover what region of whisky might suite your pallet. Then the tasting! Following which you are taken in to view the World’s largest Whisky Collection – the Diageo Claive Vidiz Whisky Collection. This is just under 4,000 bottles and the room provides the most beautiful amber glow from all the stunning bottles. Have the right budget and this room can be booked for a private dinner for up to 10 guests! Completing the tour in the McIntyre Gallery to view some of the more unusual bottles in the Collection and if you are lucky to be on a Gold Tour – you sample more whisky! Our morning was then complemented by a visit to Amber Restaurant for some excellent Scottish Fayre and need I say it more whisky if you wish. I attended the Edinburgh Tourism Action Group Digital Conference on 20th November, the first of its kind of conference and some very enlightening speakers and information. 68% of visitors booking a holiday commence their journey on line and over 50% in 2015 are doing so on a mobile device, so are we all ready for such users? 64% of customers expect an instant response and this will only increase over time when the younger user expects all web sites to have live chat so someone can respond immediately to their demands and questions. Does this in time mean the decline of brochures, emails, telephone calls? What also emerged is the greater need of images and people can visualise the experience before they buy. Many people want to engage with your product and selfies are becoming the norm so your customer is providing your visual gallery for future customers. Pintrest users are 3% more likely to share content on a mobile device and 52% of total users pin their images from a mobile. Follow your visitors and interact following their image postings – a good endorsement and way of saying thank you, come again. Social media can be a mind field but most certainly worth investing the time and training to get this right. Many tourism products push Facebook and do so very well but are they viewing the reach statistics and engaging with their customers. The 5 stages of the travel process: Dream – Plan – Book – Experience – Share – an opportunity to engage at every stay and make it easier for the consumer. I am delighted to celebrate the Susan Reid Collection being in business 12 years today, 3rd November 2015. I set up the business 12 years ago as I personally feel that companies need to invest in cost effective campaigns and pro active sales and marketing activity to increase their company profile and attract potential clients. It is also very important to continue to communicate with your existing client base, focusing on e-marketing and emphasising your unique selling propositions to the market place. I personally take a pro active sales role with every one of my clients which is quite unique in the market place and was one of its first to be launched in Scotland with continued success. This enables me to feedback to the property/venue owners the response from buyers and how we can further develop and improve on our level of service, quality and experience to the customer and secure more business. From my many years in larger organisations prior to setting up the Susan Reid Collection, I can offer the professional skills and knowledge I have gained from the larger organisations and assist in the promotion purely of privately owned properties, ensuring their awareness is strong in the corporate, leisure and incentive market place. This can only be achieved by concise and pro-active sales and marketing strategies of which they are carried out by myself alone. I would ask you to take the time and visit my web site on Susan Reid Collection Web site which outlines the properties on my Collection ranging from privately owned hotels to exclusive use properties and castles. We are being contacted at Estate Life for wedding enquiries and delighted to offer an excellent range of properties and locations to our prospective bridal parties. We are also now handling many birthday party and house party celebrations where a group of friends are coming together in the wonderful surroundings of their very own exclusive use castle. 1. the property is exclusive for your wedding and party ensuring for one you are the only bride and the dream of your castle wedding can come true with out help. 5. worried about children being entertained at a house party or wedding, then take them to a castle with great places for games, entertaining in the grounds and not to mention dressing up like prince and princesses. 6. Accommodation in many of the venues is small but perfect for the night before or night of the Wedding. Also ideal for birthday parties with say up to 10 couples and the cost remains very competitive. The price can quite often be less expensive than using a hotel, catering is less expensive, fewer staffing costs and quite often you can supply your own soft drinks and alcohol so continually saving costs in all areas. Rural properties are also now much better with wifi connectivity and no charges! Exclusive use properties offer complete flexibility on timings and therefore you can start and finish your meeting when it works for you and not to accommodate other events taking place in the building. A more relaxed and productive environment as you can choose to sit round a boardroom table, walk in the grounds, sit in the sunshine, relax in the drawing room – what ever space you feel is the most productive for your meeting and event. Last but by no means least, you are contributing to the sustainability of a traditional and historical building, excellent Corporate social responsibility and feel good factor. What is Destination Management Hire and why so important to work with them? Therefore to attract this market it is all about the destination and how you present your property and the range of what can be offered both on site and off site in the local area. How close are you to the Airport. If there is over an hour in transfer time, then where are the nice spots to stop en route for a meal or activity to break the journey. Think of yourself as the tourist information person and sell sell sell your destination. Also do not presume when you are dealing with agents with offices located close to your venue that they will know all you can offer on property and in the surrounding area – you have to tell them of this. You might also consider the hire of your venue for lunch only or dinner only venues. This way clients can view the facilities you have to offer and consider using the accommodation on future occasions if applicable. Estate Life are unique in the market place as we not only offer the consultancy expertise, but I personally have first hand knowledge of a strong client base sourcing such properties, know the market conditions and what the clients are looking for from private properties. We are now handling weekly enquiries for private properties which we take right to the point of confirmation. As an added advantage to being an Estate Life Network partner, properties also now benefit with our agreement since April 2013, where we are now handling all the Scottish property enquiries for Rural Estates, based in England. They have an extensive web site promoting both their own properties they have sourced and all of our Estate Life properties. Every enquiry is directed to myself to handle and find the most suitable property for the client. If the selected property is not available then it is our role to secure alternatives for the end client. Due to an increasing demand for more pro-active marketing of the properties to my extensive database, we have devised a 6 month Marketing Package which if you an in the habit of spending money on advertising is a lower cost than a one off advert in a magazine or newspaper. For a nominal one off fee this is an ideal solution for private properties wishing to test the water with marketing their property. Tullibole Castle in Kinross-shire have done just that and signed up for a 6 month marketing campaign and within a matter of days have a meeting set up with an agent for a key event in 2014 due to our excellent client relations with said agent and being able to facilitate the meeting. A meeting they have been trying to arrange for months.